Jalsa Salana has started in Qadin today and similarly in some other countries also. There was a time when Jalsa Salana used to be held only in Qadian, India. Then after partition, Jalsa Salana started taking place also in Pakistan. But after a time the remembrance of Allah and His Messenger, the Holy Prophet of Islam, by the members of the Ahmadiyya Muslim Community, became unbearable for the Pakistan government and this was stopped by law. In this way they thought they had succeeded in depriving hundreds of thousands of Ahmadis from remembering Allah and His Messenger. But the opponents of Ahmadiyyat do not realize that while these restrictions can impose restrictions on the physical body they cannot have any impact on the hearts. All the physical pain and losses thus imposed cannot take the love of God and His Messenger from our hearts. These, our opponents are, strangely enough, those who claim to be the proponents of the same Kalima that we believe in …instead of being happy to see that every single one of us, and even our children, are attached to the same Kalima they believe in and all of us are prepared to offer every sacrifice for its upholding they still try to stop us from saying this Kalima by all allowed and disallowed means possible. Every fair-minded person will call the opposition of all our opponents not just the opposition to Ahmadiyyat but will call it opposition to Islam. In any case the month of December is for the Ahmadis of Pakistan a very emotional time by virtue of the fact that this is the month for the holding of the Jalsa. May their emotions be accepted by God in such a way that every opposition and difficulty is removed so the ahmadis of Pakistan may also benefit from those blessings that the world of Ahmadiyyat is benefitting these days. 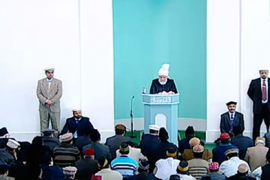 The opponents, supported by governments, thought that by placing restrictions on the Ahmadis they would stop our progress but what happened is that today these Jalsas are taking place in many countries and during the year they take place in all the countries where the Jama’at is established. That is to say this institution started by the Promised Messiah (as) has now acquired a global status. Even non-Ahmadi Muslim and also non-Muslim leaders of all backgrounds say that these Jalsas make the world aware of the beautiful teachings of Islam. The world is learning about the teachings of true Islam from Ahmadiyyat. This was destined to happen as the Promised Messiah (as) had himself said that do not think this Jalsa to be some ordinary kind of gathering – this is the Jalsa through which the name of Islam will be elevated in the world. Human efforts alone will not suffice, the Help of Allah will also manifest itself and bring about the results. The Promised Messiah (as) explained further that the foundation stone of this movement has been put in place by the Hand of God Himself and He has prepared nations who will soon come and join them because this is the work of that All-Powerful One for Whom nothing is impossible. The time is near when nothing will remain in this faith of those who worship nature and hold on to superstitions and do not believe in the miraculous powers of God and of those who make all kinds of worthless things a part of the faith and God Almighty will establish for this Umma the middle path. That same path which the Quran brought. That same path which the Holy Prophet taught to his Companions (may Allah be pleased with them). That same path which the Siddiq [Truthful ones], Sulaha [Righteous ones] and Shaheed [Martyrs] were blessed to have found and followed. This is what will happen. Indeed this is what will come to pass. He who has ears let him listen. Blessed are the ones to whom the straight path is disclosed. This Jasla is indeed such as can bring about revolutions in the minds of the people and that is what it ought to bring about. And different nations are joining in these Jalsas. In Qadian 31 nations are joining. Thus by placing restrictions on our Jalsa in one country our opponents had imagined that they had dealt a powerful blow but the enemy is misguided and does not understand that the Imam of the Age had not said that he was establishing a Jama’at but had said that the Hand of God had put in place the foundation stone of this Movement. So, if our opponents have the power they can try to oppose God but they should remember that the Promised Messiah (as) is that beloved of God who enjoys His special Help and Succour because he was the one who was sent to rejuvenate the faith by God Himself. So before opposing they should pay heed to what is written in this announcement of the Promised Messiah (as) that before you attack you should take a look at who you are attacking and who is supporting the person you are attacking. They may be able to hurt a few individuals but how can they damage the Jama’at set up by God Himself? So what to talk about one government, the combined power of all the Governments cannot succeed in destroying the Jama’at, insha’Allah – because this is that Jama’at which will establish in the world that pure and true and perfect faith which, shorn of all additions, and innovations, had been brought into the world by our lord and master the Holy Prophet Muhammad (sa). The Movement which is established to manifest the glory of God and to make clear and prove to the world the blessings of His Messenger and is planted by the very Hand of God Almighty then such a Movement is taken care of and protected by the very angels of God. Who can destroy such a Movement? Remember that if my Movement is merely a business its name and every sign of existence will be erased. But if it is from God and most certainly this is the case then even if the entire world opposes it, it will still go on growing and spreading and the angels will protect it and safeguard it. He goes on to say that even if I am not supported by a single person, and no one supports me even then I believe that this Movement will succeed. These are most powerful words that have been stated making God a witness…So how can the enemies succeed. But we must remember that we too have responsibilities. Every Ahmadi must bring about in him or herself that revolutionary change that the Promised Messiah (as) desires to see in each of us. Our mere participation in these Jalsas is not enough. We must assess ourselves. We must become among those who become deserving of receiving the blessings of the prayers of the Promised Messiah (as). People write to me asking that we become such people. Is it enough to just join the Jalsa to become such blessed people. No. We have to assess and see whether the change we feel when we join these Jalsas is just a temporary thing or whether it will become a permanent feature of our lives. If we leave every such Jalsa with the full intention to change our lives and become those who will make the needed changes to their lives that are desired by the Promised Messiah (as) then we will go on becoming the recipients of the blessings of the prayers of the Promised Messiah (as). If we do not do this it will be like us saying to Allah that we have not listened to your command but (2:187) we want to be the recipients of the blessings of the Promised Messiah (as)’s prayers. We have to benefit from the environment and atmosphere of the Jalsas and couple these with efforts at making changes in our lives and then pray and then we will become the recipients of the blessings of the prayers of the Promised Messiah (as). Efforts and prayers both are necessary. When Allah the Exalted says that listen to my commandments and pay heed to what I say what are those things that we have to obey and follow? We know what these are. These are the things that are found in the Holy Quran from its beginning to its end. And then, by way of another favor, Allah has made clear to us the import and deep meaning of these commandments by sending the Promised Messiah (as). So now we have no excuse. Just with reference to the Jalsa where the Promised Messiah (as) has explained to us to discharge the duties we owe to Allah, there, he has explained to us also the need to discharge our obligations to our fellow man also. After drawing our attention, the attention of those attending the Jalsa to righteousness, purity and piety he drew our attention with great pain and feeling, that we should become exemplary in soft heartedness, mutual love and brotherhood – that we should be those who display humility and be ready to make sacrifices for the sake of each other and be such as those who establish new and high standards of truthfulness and good conduct. We should be such as stay away from foul talk and discourteous behaviour. So everyone needs to assess himself from this point of view. Are we exemplary in possessing these high morals? Are we making such exemplary sacrifices in helping others? Do we, today, possess those high standards of humility which the Promised Messiah (as) wishes to see in us and which are mentioned by Allah, the Exalted, in the Holy Quran and the examples of which were established for us by the Companions of the Holy Prophet (sa)? If these are not present in us, then the effort is not there that is needed for us to be the recipients of the blessings of the prayers of the Promised Messiah (as) and we are holding on to great hopes. So all those Ahmadis who participate in these Jalsa Salanas in general and those who join the Jalsa in Qadian especially must feel the concern and pain that is conveyed by the Promised Messiah. If we are to really become the inheritors of these prayers of the Promised Messiah (as) then we need to realize that even in ordinary relationships those children who listen and pay heed to everything their parents say and devote themselves to their service they are the ones who become the recipients of their parents’ prayers. So if we wish to eat the best fruits of the relationship we have with the Promised Messiah then we need to also become fully devoted to him. Let me present some of the writings of the Promised Messiah (as) from which it becomes clear what he desires from us. If our Jama’at wishes to become a Jama’at the it must accept a death and safeguard itself against material and carnal desires and wishes and hold Allah, the Exalted, above all other things. Many vain and hypocritical pretentious things destroy a man. At another place he says: You should try to safeguard yourselves from every type of passion that may lead you astray. Every stranger whom you meet looks upon you and sees your morals and habits and level of perseverance and looks to see how far you abide by the commandments of God. If these are not of the highest grade then he is misled by you. So remember all these things. Similarly, I say that if any one does not show sympathy to a brother of his he has not shown sympathy to the whole of mankind. He said that you should not love life so much that your faith should be lost. Then he says this Jama’at which He desires to make an exemplary Jama’at, if this too becomes such that among them is not found brotherhood and sympathy then it would be a great misfortune. Then he says: I say it truly that the faith and the world cannot exist simultaneously…yes by way of service it can exist but not by way of partner. It has never been heard that a person who has a pure untainted connection with God has been seen begging for sustenance from the world. The fact is that Allah, the Exalted, even takes care of the progeny of such a one. Then at another place he says [Huzur Aqdas says this is worthy of listening to with great care and attention]: Only those should be considered to be members of our Jama’at who, in accord with their oath of allegiance [bai’at] truly give precedence to the faith over all worldly matters. When a person, keeping in mind this oath, moves towards God, then Allah, the Exalted, bestows upon him strength. These are a few of the Promised Messiah (as)’s directions, advice that I have taken that he gave to elevate the spiritual and moral standards of the members of the Jama’at. He has given innumerable such pieces of advice. We should keep these in front of us and try to develop a clear distinction between ourselves and the others. Without this we cannot fulfill the purpose of entering into the bai’at. The Promised Messiah (as) made it clear that by understanding some arguments or by making our opponents silent and gaining victory over them by arguments alone we cannot win the pleasure of Allah, the Exalted. It is not enough for us to just acquire knowledge. Acquiring knowledge has its place but in order to please Allah, the Exalted, and in order to absorb His love we need to make progress in our deeds and actions. We have to change our condition. We have to impose the demands of the commands of Allah, the Exalted, upon our own selves and our condition. So in order to acquire the nearness of Allah, the Exalted, first we have to make an effort ourself. Similarly to become the inheritors of the benefits of the prayers of God’s elect we have to strive to achieve these benefits. So we should benefit from the environment that these Jalsas make available to us to advance in our fulfilment of the duties that fall on us to fulfill our obligations to God and to His creatures so we can travel along the paths to His nearness as quickly as possible. May Allah bestow upon us the ability to do so. The second thing that I want to say especially for those in the Jalsa in Qadian is that the Promised Messiah (as) had directed those who come there to bring with them their bedding as per the deason needs. So those who live in India should act on this instruction as far as is possible and indeed those coming from Pakistan also. There is some arrangement but it is not sufficient and those coming from outside also should take warm clothing with them as much as they can as I am sure they must have done. In any case they should take due care and sleep with warm clothing. The real purpose of these Jalsas is to benefit from the spiritual environment and paying attention to our practical lives try and absorb benefits. The people from Europe also may feel the cold. As they are used to heating in their homes. Everyone should all be content with whatever is made available and render thanks to Allah. The Jama’ats also should inform all attendees of the conditions before they leave and insure that they go there prepared. It has been seen that sometimes lists are not provided in time. Jama’ats should insure that they provide the things that are sought in a timely manner. This is the responsibility of the Ummara. Similarly some people make demands that they must be accommodated in a particular place or a particular guest house etc. Now the arrangements are made for the 16,000 or so attendees and it is a good arrangement that is made for them but if some people suffer discomfort due to their own health or age concerns then it is better that they do not go the Jalsa..to come to the Jalsa and benefit from it some pain and difficulty will have to be suffered. Every year people see the signs of the better arrangements and as Allah had directed wasay makanaka …arrangements for accommodation go on growing. Allah, the Exalted, goes on bestowing upon us greater and greater expansion in accommodations and the officers try to do whatever they can. So those who are in the habit of making demands they should even if they have to suffer difficulties they should still try and cooperate with the officers and those incharge of making the arrangements and they should try and see how by coming the town of the Promised Messiah how are we going to try and maximize the benefits they can gain. And in order to do this, instead of focusing on the worldly comforts search for those things and look to acquire those things that the Promised Messiah (as) desires from us. By the Grace of Allah all those who go there, except a few, are examples of sincerity and loyalty whenever they go there and no matter from where they go. When they write, after having gone there, one sees an amazing account, pleasing account of these experiences that Allah causes to grow among them, in them..so I say to the earlier Ahmadis for whom I have some complaints, those upon whom materialism has had an overwhelming effect, I say to them that they should look at these newer Ahmadis and see their sincerity and loyalty. Everyone who joins this Jalsa instead of looking for these comforts should try and immerse himself in the spiritual environment that exists there and spend their time in prayers. In these days especially while they pray for their own faith and they should also pray for the progress of the Jama’at and the strengthening of the links with Khilafat and the Jama’at. They should pray also that they become capable of fulfilling the wishes and desires that the Promised Messiah (as) had from the members of the Jama’at. Pray for the Jama’at, for the Khalifa of the time, for one another – these prayers of the participants will also be of great benefit to all of them. Insha’Allah. Pray also for the success of the Jalsa and for the evil of our enemies to turn back upon them. Pray that we see the mission and purpose of the Promised Messiah (as) being fulfilled quickly. Spend your days and nights and mornings and evenings in the remembrance of Allah then alone will you be able to gain the benefits of participating in the Jalsa. May Allah, the Exalted, bless all of you with this ability. May Allah, the Exalted, show us quickly those scenes when we will witness the world join the Muhammadi Messiah and come together under the flag of the Holy Prophet Muhammad (sa). Huzur Aqdas (ab) said he would lead a Janaza in absentia also after the prayers – that of Ahmad Shamshair Sukya Sahib, former Missionary of the Jama’at who passed away on December 24, 2014 in Mauritius. Inna lillahay wa inna elaihay rajayoon.